I am a big proponent of hydration, just ask my kids. I’ve even been nicknamed “Ms. Hydrate” by a friend. Water is essential to the human body. Carrying drinking water around with you ensures you will drink often. Kids especially need to be reminded to drink water throughout the day. They say that if you feel thirsty, you are already dehydrated. My children carry either [amazon_link id=”B003BG0Z6E” target=”_blank” ]Lifefactory 22-Ounce Beverage Bottle, Red[/amazon_link] or [amazon_link id=”B004DAG5QQ” target=”_blank” ]Klean Kanteen 27 oz Stainless Steel Reflect Water Bottle (Stainless Bamboo Cap) – Brushed Stainless[/amazon_link], but if they don’t get the lid on just right, they do leak. The CONTIGO Striker kid’s water bottle is perfect for children who have outgrown Sippy cups but not spills. The CONTIGO kid’s cup incorporates AUTOSPOUT technology plus spill-proof valve system, eliminating spills and leaks even when the bottle’s spout is in the open position. The CONTIGO Striker water bottle features a spout cover which keeps the spout clean and protected when not in use. Kids love the easy to use one-touch button that opens the spout. 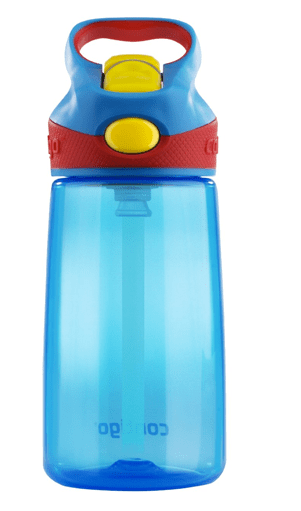 Parents love that the CONTIGO Striker Kids bottle is BPA free and top-rack dishwasher safe for easy cleaning. The 14-Ounce. Striker is perfect to bring on-the-go, pack in lunch boxes or for staying hydrated during sporting events. Recommended for children ages 3 and up. CPSIA certified. Many parents feel more comfortable with plastic bottles and children, but I am not one of them. I do not trust plastic, BPA-free or not. I especially don’t trust it in the dishwasher. The valve system is cool, but I don’t worry too much about spilt water. It is water, and it will dry. This bottle is made in China. Back to School: Toilet Seats are Cleaner Than Cafeteria Trays! Hank D and the Bee: BUZZ! Organic vs. Conventional: Is the Proof in the Nutrition? Are your kids shoes toxic? Hank D and the Bee: The Defenestrator and The Exfoliator–Dynamic Duo? Create fun images with Fotor online photo editor!